The extraordinary story of Susan Alberti, a lady of many firsts.The woman from the working-class suburbs has battled boardrooms, cancer, diabetes, open-heart surgery and shed 59 kilos-half her body weight-on the road to recovery. She has stared down adversity and prevailed.When her first husband was killed by a truck, Susan took over their construction business. When her only child Danielle died from type 1 diabetes, she embarked on a global mission to find a cure. When her beloved AFL club the Western Bulldogs was threatened with annihilation, she worked tirelessly to bring home the 2016 premiership. Confronted with the exclusion of women players from AFL, she fought to open the game to all. No tragedy, no challenge, has proved too hard for Susan Alberti. 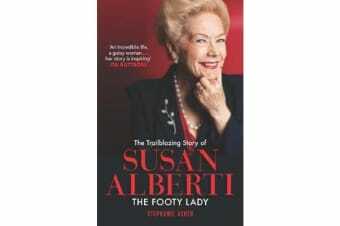 The Trailblazing Story of Susan Alberti is a tale of determination and resilience. Written to honour a promise made to Danielle two weeks before she died, it will inspire you to take on the seemingly impossible and triumph.